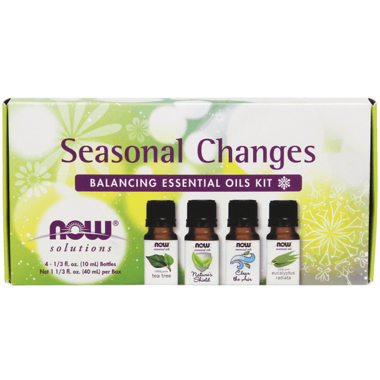 NOW Seasonal Changes Essential Oils Kit was created for year-round well-being. For many of us the change of the season is an exciting time that heralds the arrival of special holidays or outdoor fun. But for some these changes aren’t quite so magical. If you’re one who dreads the seasonal switch, take heart! This kit was created just for you. Featuring a unique collection of natural aromas, including Tea Tree and Eucalyptus Radiata oils, as well as Clear the Air and Nature’s Shield oil blends, this pack can help ease seasonal transitions so you can get back to doing what you love. Tea Tree, Eucalyptus radiata: For aromatherapy use. For all other uses, carefully dilute with a carrier oil such as jojoba, grapeseed, olive, or almond oil prior to use. Please consult an essential oil book or other professional reference source for suggested dilution ratios. Nature’s Shield: Add to a diffuser to purify and cleanse rooms, or create a room mister by adding 10 - 30 drops to 1 oz. of water in a spray bottle. Great blend for travelers and to promote a healthy environment. Clear The Air: Add to a diffuser, or create a purifying room mister by adding 30 drops to 1 oz. of water in a spray bottle. Great for travelers or for seasonal use. Caution: Keep out of reach of children. Avoid contact with skin or eyes. If pregnant or lactating, consult your healthcare practitioner before using. Not for internal use. Natural essential oils are highly concentrated and should be used with care. Great quality oils, smells great too. I recommended it! Great collection of oils! The nature's shield is my favourite.